Product prices and availability are accurate as of 2019-04-22 19:58:11 UTC and are subject to change. Any price and availability information displayed on http://www.amazon.com/ at the time of purchase will apply to the purchase of this product. 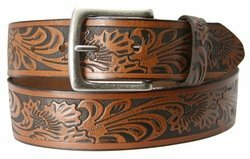 A genuine cowhide leather belt, fitted with a plain metal belt buckle. 1 and 1/2" wide. Our belts are measured from where the leather ends at the buckle end to the middle hole at the tip end. 1-1/2" =38 mm wide Embossed soft genuine solid one piece leather Belt. Western Style Design With Hand-Brushed Oil Antique Look. 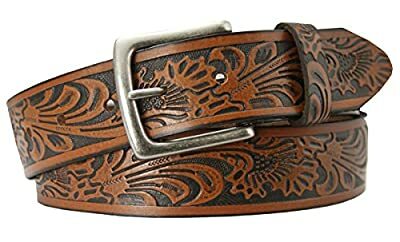 Leave embossed all around the belt. Antique silver buckle. 7 holes for a better fit adjustment. Made with snaps for interchangeable buckles: Just snap off and snap on. Belt is measured from where the leather ends at the buckle end to the middle hole at the tip end. In order to get your size, measure a belt that currently works for you from the fold where the buckle is to the hole where you wear the belt. That size in inches will be your belt size just round the number if you get an odd number.